Warrior and the Wanderer is the first book by Elizabeth Holcombe that I have read and, although it is a genre that I don't read much of, I enjoyed it more than I had anticipated. 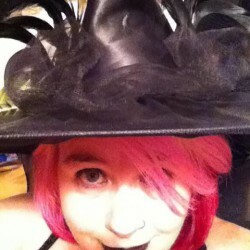 It is historical romance, with a nice bit of time travel, and it made for a really fun read. Ian MacLean is from the present, on the downside of a once thriving musical career until he basically trashed it. He is used to getting what he wants, using his voice to do it and now he has having a hard time adjusting to life on the down side. One day he is driving through the Nevada desert in 2014 and the next he finds himself in a lake in Scotland... in 1512. It is in this unlikely place that he meets Bess Campbell, tethered to a rock by her not so loving husband and left to die. 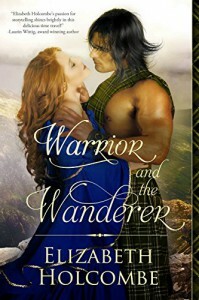 He saves her and finds himself this warrior clan chief's prisoner, all because of the insane complication of sharing a surname with that husband. The time travel aspect led to some funny moments as Ian struggles to understand his situation, initially believing he was being held by cult-like LARPers. He just can't wrap his mind around the fact that he has actually traveled back in time, improbable as that might be. And those of medieval Scotland can't understand Ian's strange clothing and words and mannerisms. Against all odds, Bess and Ian fell for each other and their romance was fun to read. Nothing came easy and I like that because it made their romance believable in the midst of an unbelievable scenario. I liked, too, that in this story, it was the man that was sure of his feelings and the woman who balked. While an HEA was expected, there were still questions right up until the last pages as to how it would end and I liked that it wasn't too easy to guess. If you like a good romance, historical or not, with unexpected moments of humor, this is a good read. The time travel aspect added a lot to the story and I enjoyed it. I gave it 4.5 mugs!